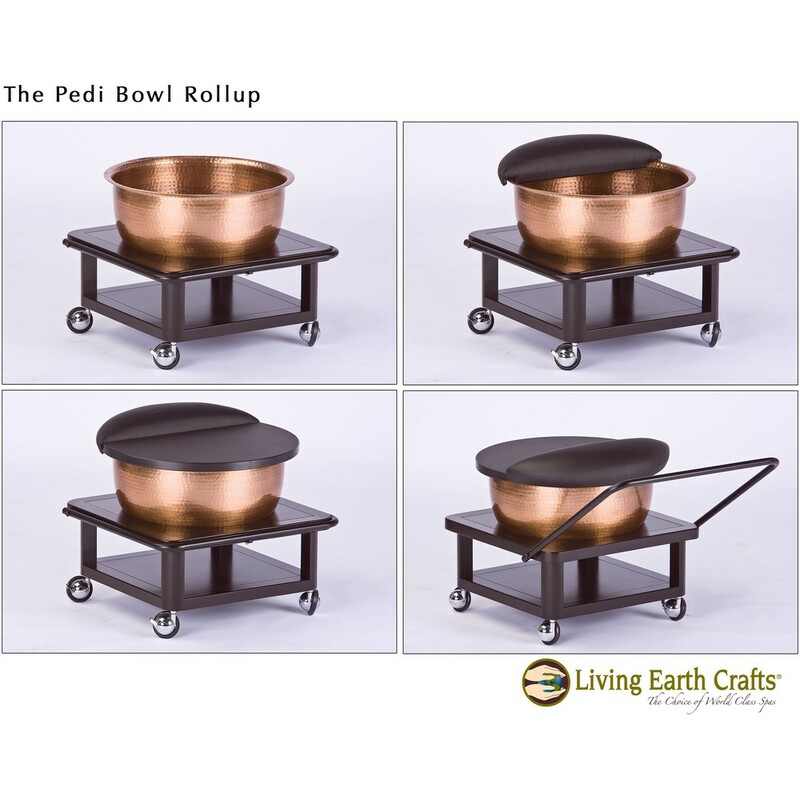 The Copper Bowl Roll-up Foot Bath™ is a simple yet elegant hygienic alternative to noisy thrones or jets. 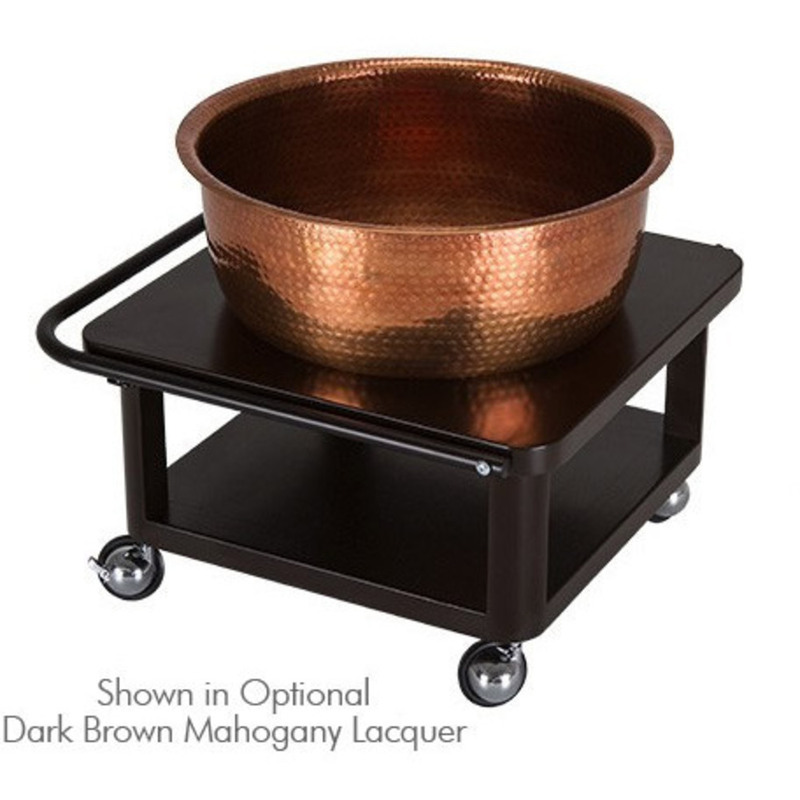 The hammered copper bowl is lightweight, yet large enough to accommodate up to size 14 feet. Perfect for reflexology work and pedicures, it comes with a handcrafted custom stained trolley with an ingenious fold-up handle for easy transport. Complete with a removable footrest pad luxuriously upholstered in a water-resistant fabric and a highly durable HDPE splash guard cover. Shown in optional Brown Mahogany Lacquer. Notes: Living Earth Crafts products are made to order. Actual shipping costs may vary from those shown at check out. We will contact you if any adjustment is required... or call us at 800-434-0018 and request a shipping quote... ask about curbside delivery, inside delivery and white glove delivery options! Explore the color, beauty, and experience of personalizing your furniture to match your spa décor. By combining one of 21 stain or lacquer options your furniture goes beyond being an essential piece of equipment, it becomes part of your design and vision. Get inspired! Colors may vary from computer/devise screen. For precise color matching please call for samples.